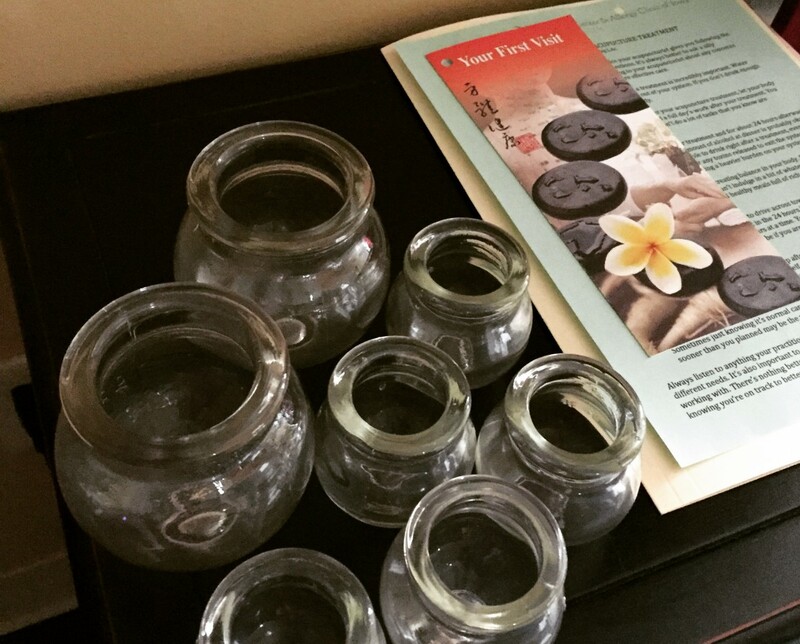 Traditional Chinese Medicine (TCM) encompasses a variety of modalities including acupuncture, cupping, tui na, gua sha, moxa, herbal therapy, and food therapy. Acupuncture has been practiced for 3000-5000 years. It is defined as the insertion of sterile, disposable, single-use needles into acupuncture points throughout the entire body. The points are located on meridians that course throughout the body. Through the use of acupuncture points, a particular effect may be obtained because each point has specific functions. There are as many as 2,000 points. Cupping is the use of glass cups to create a suction of the skin. The most common place to cup is the back, legs, hips and shoulders. Cupping is the therapeutic use of suction to increase blood and oxygen flow to the area. This helps relax the muscles, stimulate acupuncture points and decrease pain. Cupping helps with conditions of coughing, pain, poor sleep and more. Bruises are a common side effect of cupping, depending on the patient’s condition and constitution; the bruises should only last 3-7 days. Electrical Stimulation Acupuncture (E-Stim) is the use of a tens unit along with the acupuncture points to provide constant and measurable stimulation to the desired points. E-stim is effective with increasing the results of post-stroke symptoms and reducing pain. Gua sha, meaning “scraping sha – bruising” is the use of a spoon, jade or other utensil that scrapes the skin to produce light bruising. This releases unhealthy elements and increases blood flow and healing. Herbal therapy has been around for thousands of years. It is a useful complement to acupuncture treatments because while a person may only get acupuncture treatments weekly, monthly or as needed, a person may take herbs daily to address certain symptoms and support their constitution. Herbs are great for balancing the body and for addressing: digestion, emotions, sleep, women’s issues, common colds and flu. Moxibustion (moxa) is the use of the herb, mugwort, topically to increase energy, reduce pain and benefit the overall constitution. Tui na “twee- nah” is a combination of massage and acupressure that uses the meridians and acupuncture points to increase the movement of qi and reduce pain.